Pattie Boyd was the center of rock and roll's most epic love triangle. Flickr/Wikimedia CommonsPattie Boyd with Geoge Harrison 1966, and Eric Clapton on guitar 1975. There are women who marry rock stars, and then there’s the woman who married two. Pattie Boyd was a blonde, doe-eyed girl from South West England. After finding success in modeling, she was cast in the famous 1964 Beatles film A Hard Day’s Night. She had a single, one-word line. But a more notable result of her casting was in meeting George Harrison, whom she went on to marry. A more notable result of her marrying George Harrison? Meeting his good friend Eric Clapton. Born in Somerset, England on March 17, 1944, Pattie Boyd moved to London in 1962.She found work at a beauty salon, but was quickly inspired to pursue modeling. Her modeling career took her to New York and Paris. She worked her way to the front cover of Vogue magazine. In 1964, Boyd got a call from her agent. He told her to report to London’s Paddington Station, she had been given a small bit role in a film by involving the Beatles. In A Hard Day’s Night Boyd played the part of a schoolgirl whose only line was “Prisoners.” Small a role as it may have been, it was enough to get George Harrison to notice her. At lunch, on set he asked her to go out with him, or more specifically, he said, “Will you marry me?” Boyd had a boyfriend at the time, so she declined. Their marriage was marked by several milestones. The Beatles song, “Something,” on the album Abbey Road was written for Boyd by Harrison. It was Harrison and the Beatles who introduced the formerly innocent Boyd to LSD as well. She also claimed that she was the one who introduced Harrison to meditation, leading to the Beatles’ highly publicized trip to India in 1968. And in 1969, Boyd and Harrison were arrested for marijuana possession after a police raid. Despite the excitement, Boyd claimed that after returning from India Harrison’s spirituality made him increasingly isolated. He would spend hours alone chanting and meditating. In the meantime, Harrison had become good friends with guitarist Eric Clapton, who had been visiting Boyd and Harrison’s home more frequently. Boyd could tell early on that Clapton was interested in her. Thus began the ultimate rock and roll love triangle. While Boyd felt neglected by Harrison, Clapton showered her with attention and compliments. It wasn’t just light-hearted flirting. Clapton grew infatuated with her. As Boyd recounts, Clapton invited her over to the London apartment he shared with his Derek and the Dominos bandmates. He wanted to play her a song he was working on.”It was the most incredible song,” she said. The song he played was about a man completely captivated by a woman, begging her to be his. The song was “Layla,” and it is arguably one of Eric Clapton’s most famous songs to date. Harrison was furious, telling Boyd in a bout of anger to just go off with Clapton. She didn’t. Instead, she stayed with Harrison for another three years. What ultimately made Boyd leave him was the discovery of an affair that Harrison was having. In true rock and roll fashion, it was with Maureen Starr, the wife of Beatles drummer Ringo Starr. Boyd and Clapton moved in together and married in 1979. Which could almost, in a weird swinging-sixties-rock-and-roll kind of way, be considered a happy ending. 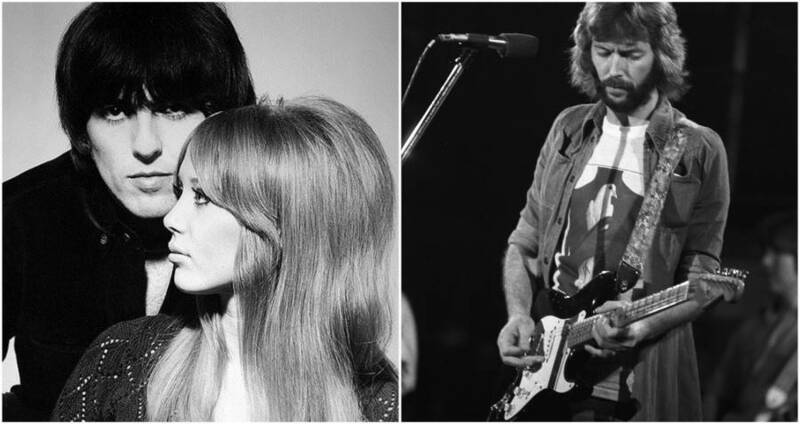 Except for the fact that their relationship was also riddled with infidelities and turmoil: alleged affairs on both sides, Clapton’s increasingly alcoholic tendencies, and finally a baby by another woman resulted in a separation in 1987 and a divorce in 1989. When Harrison died in 2001 after a battle with cancer, Clapton was the musical director for the “Concert for George” tribute show. As for Boyd, she married a third time in 2015. It was her first marriage to a non-musician – Rod Weston, a former property developer. if you found that interesting, you may also like these surprising stories behind 5 of your favorite Beatles songs. Then read about the Beatles in 1957.